Holy Guacamole. Ms. Rose has done her homework here. This Indie publication is concise, professional, and well edited. Better yet: this is one of the rare books on book promotion which addresses fiction writers' needs. In whole, Rose's book serves as a very timely snapshot of the hustle and the choices that 2011 authors face. Take note of that word "realities" is in the title. Rose does not pull any punches here. She tells you (many times) just exactly how difficult it is to succeed as an author. If you're having the sort of day wherein you need a cup of warm milk and a pat on the head, save this book for tomorrow. But read it. You'll be glad you did. The first section of the book is a frank discussion about how you'd like your work to be published. Because Blurb is a Verb deals with book promotion and not publication choices, that section of the book is beyond the scope of our conversation here. Authors who believe that Amazon is the Evil Empire will not see eye-to-eye with this author. Yet because this book is entirely based on well documented first-hand experiences, even dissenters won't mind hearing Rose out. "Part II: Marketing" is what I came for, and is well worth the price of admission. The section on bookstore signings alone is invaluable. Rose also gives straight talk about Facebook fan pages and her experiences with Twitter. She loves statistics, and uses them wisely. There are concise instructions for simple technical tricks that many authors will find useful, but don't expect to find technical advice for every platform. Rose is very clear that she favors Wordpress, and finds her blog there to be a more useful tool than her more expensively designed web pages. To that end, many of her technical tips involve Wordpress. If you're devoted to Blogger, some of the information won't be quite as applicable. But I don't think you'll mind. Because Rose's opinions are the strength of the book. The format is "here's what I've tried, and this was the result that I experienced." She doesn't attempt to cover everything, but the topics she covers are strong. Her lucid discussions of what authors can gain on Twitter and by blogging is well written. Both are populated with "Dos and Don'ts" in a terrifically no-nonsense fashion. I.E: "DON'T blog from your character's point of view. I've done this. No one cares." And if you've ever wanted to visit a SF/F convention to sell books, her chapter is a must-read. 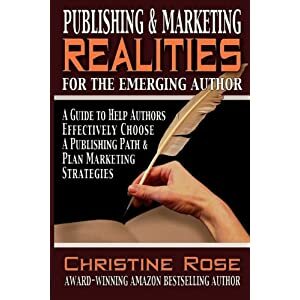 The third section of this book describes in detail how to publish e-books on Kindle, use Smashwords and PubIt! The fourth section is a set of fun essays. I particularly enjoyed one by Skyler White entitled: "Advice from my Published to my Unpublished Self." That's all we're really looking for in a book like this, isn't it? A shortcut past the mistakes we're likely to make, and answers to all the questions we're not yet smart enough to ask. Disclaimer: I received a free copy of this book when I expressed interest in reviewing it. Of all the reviews I've read of all the books in this vein, this one sounds like the most practical, at least for me. Thanks. You're right, Petrea. That's what I liked about it. Awesome, straight-on review of information I need. Thank you! I went straight to B&N and downloaded the Nook version. Thank you for the entertaining review of what sounds like a wonderful addition to my library. Great review! I just picked this up on my Kindle!